Alison Sweeney and her spouse are together for nearly 2 decades and they certainly know how to keep their relationship flourishing. Long lasting relationships often carry the certain charm that makes it capable to go the distance. It's not unusual to see couples being supportive and caring to keep the relationship healthy. However, it's not always you see a duo abiding by a particular annual tradition of their own to ensure their marital relationship keeps blossoming. 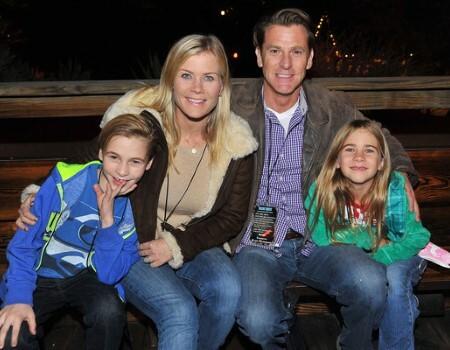 Alison Sweeney is married to her husband David Sanov. The couple tied the knot on 8th July 2000. The pair first met when David appeared on an episode of 'Days of Our Lives'. They fell in love soon after and dated for three years before embracing each other as life partners. In February 2015, Alison speaking to Health magazine revealed she had a couple of big milestones coming up. One was the obvious one - she was set to celebrate 15 years of their marriage. The other one, however, was a bit intriguing. "Every year on our anniversary, we have a dinner date and talk about how our relationship is going." "We kind of give each other a job evaluation, which sounds a little embarrassing! We talk about our three favorite things about the other person and then three things that we could work on." Apparently, the duo takes a few minutes to compliment the three favorite things about each other as well as revealing the three things both need to work on. A perfect example of a couple who knows how to keep blossoming a relationship. Meanwhile, David is a California Highway Patrol officer who has also appeared in a television series Days of Our Lives as a police officer. This appearance actually ended up being decisive in both of their love life. The couple shares two children together, a son named Benjamin Sanov who was born on 25th February 2005, and a daughter named Megan Sanov who they welcomed on 12th January 2009. The entire family resides in Los Angeles. "We had a contestant this season [on The Biggest Loser] who said she was going to love herself when she got to her target weight... I almost started to cry." "As a mother of a daughter, I couldn't lose the opportunity to explain that there will always be something. You need to learn to love yourself no matter what your situation is. Body image is an issue very close to my heart." Alison added, she struggled with negative thoughts and there was something human in that. However, you can't let it bring it down nor allow that feeling to take over. Sweeney suggested one should acknowledge the thought and just move on. She believes that's something one can practice and get gradually get better at it with time. Alison Sweeney's first episode of Days of Our Lives aired as far back as 6th January 1993. After two decades, the actress decided to leave the show in 2014. The actress' schedule was far from empty even after she had left. It was nowhere near as dramatic but she was a host of the reality show The Biggest Loser at the time and on course to direct General Hospital. "The head of it was wanting to be more available for my family and have more time to spend with them and be more flexible with my hours." "I still have a lot of big stuff I want to work on and projects I want to be a part of, and if I want to make all those things happen there would be something I’d have to give. So I decided to take some time away from Days and see what else is out there." Although she was busy with other projects, the major reason was undoubtedly spending more time with her family. "They don't watch the show, but the children are really excited to have their mother around a whole lot more now!" In March 2018, it was officially confirmed Alison Sweeney would be returning to Days of Our Lives as Sami Brady leaving her fans joyous upon hearing the news! Born on 19th September 1976 in Los Angeles, California. Her parents are Polly Sweeney and Stender Sweeney. She has two sibling brothers. She belongs to Irish descent. She went to study Economics at UCLA. She left her University after her commitment to Days of Our Lives. She made her TV debut in a Kodak advertisement when she was just five. Professionally, she started acting since 1981 and appeared in a number of movies and TV shows. She is best known for playing Sami Brady in the soap opera Days of Our Lives. She started hosting the reality show The Big Loser in 2007. She wrote her own book about her weight loss titled The Mommy Diet in 2010. She made an appearance on the show Friends alongside Jennifer Anniston. Her net worth is estimated to be $9 million.